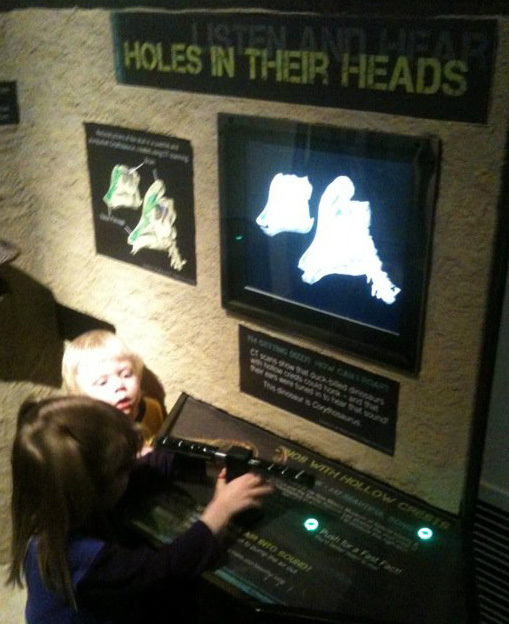 Hadrosaur multimedia exhibit at "Dinosaurs Unearthed" at the Dallas Museum of Nature & Science. Photo courtesy of Rissa Westerfield, Texas Tech University. The WitmerLab has an ongoing collaboration on the duckbilled hadrosaur dinosaurs with David Evans of the Royal Ontario Museum in Toronto. Recently, we’ve received word that some of that work has found its way into the “Dinosaurs Unearthed” exhibit that has been circulating through the US. First, Ohio University grad student Haley O’Brien texted me a photo of the exhibit at Union Station in Kansas City, and then Texas Tech grad student Rissa Westerfield posted a photo on Facebook of the exhibit at the Museum of Nature & Science in Dallas. Then just yesterday, WitmerLab alum Casey Holliday (now at Missouri) chimed in with his own sighting in KC. Presumably, it’s elsewhere, too. We’re thrilled to hear that the outcome of our research is reaching a broad audience!